A lot of things related to our diets & nutrition are becoming contested, as nutritionists & dieticians are battling in their war of words with influencers & food bloggers, the latter often with much bigger followings than people who are actually qualified to give us advice relating to our eating habits. As I have regular conversations with brand founders of supplements brands, as well as nutritionists, I choose the supplements that I use carefully, never waylaid by marketing hype. Lately protein has been a subject of a documentary on BBC & that made my trial of That Protein new launch, Nutty Nutty Peanut Butter Super Protein, particularly interesting & timely. That Protein was founder by the lovely Irish woman Darlene McCormick. Darlene has been voted Northern Ireland’s Top Businesswoman, but before starting TP, she owned one of Ireland’s top PR firms, which she sold, in order to follow her passion for plant based nutrition. By creating her own company & brand she puts her products into the limelight, while she works tirelessly in the background, replying to my messages & customer enquiries herself. She also loves spending time in her kitchen, developing new recipes that she shares regularly on her social media pages, as well as trying the ones that her customers send her. Some of you would be interested to hear that she is vegan & so are the That Protein powders. She also makes sure that her products are dairy free, non GMO, are high in fibre & Vitamins like B1, B2 & B6 & don’t contain refined sugars or sweeteners. Now, to proteins & the role they play in our bodies. Our bodies require different types of food, with the three building blocks being carbohydrates, proteins & fat. On top of that we need to add vitamins & minerals, which stimulate enzymes & chemical reactions in our bodies. Another important element is of course water! As a rule of thumb we need about 60% carbs, 10-15% proteins, which depend on your activity levels & 25% of fats, minerals, vitamins & fluids. Like with everything in life, we all need to achieve balance, which depends on many factors & our individual traits, bodies & DNA. Proteins are our body’s building blocks. As well as helping to build muscles, they support repairs within our bodies, help digestion & assist our immunity system. We mostly get proteins from meat, fish, milk products, eggs, nuts and from some vegetables. Then there are the complete & incomplete, as well as high- and low-quality proteins, which refer to the amino acids they supply. Few foods are purely one element and most of our sources of protein also supply us with either carbs (vegetable proteins) or fats (animal proteins). Meat & fish eaters probably get enough of proteins, but need to be conscious of the amount of fat they consume. Equally, vegetarians need to make sure they don’t miss on the vital nutrition block and get enough amino acids essential for building protein (muscles). When we lack protein in our diet, it can lead to anaemia, tiredness and potentially weakened immune system. Interestingly enough our brain, with its main source of nutrition being glucose, would make a very bad dietician, as it doesn’t take into account whether glucose that we consume comes from protein, vegetables or fat. The BBC1 documentary I mentioned earlier was focussed on the popularity of protein supplements and the high-protein diet favoured by athletes and body builders. The latter often consume excessive amounts of protein daily, which can lead to unpleasant side effects and potentially serious illness, if this goes on for a prolonged period of time. As a meat eater, I do get enough protein through my diet, but there are days when things get hectic and that’s where supplements like That Protein come to play the leading role. Mix three heaped table spoons with your preferred milk or add into your smoothie and that allows you to fuel the body in the right way. As protein contributes to growth and maintenance of muscle mass, I often take it after my workout and that gives my body exactly what it needs to recover after an intensive exercise session. This limited edition Peanut Butter Protein powder contains the following ingredients: partially defatted peanut powder & pea protein powder (81%), Chia Powder (10%) & Palmyra Nectar (9%). Palmyra Nectar,which comes from the Palmyra Tree in India, is an ingredient fairly new to me. It was chosen or this formula because of the raw nutrition it provides, according to Darlene and because it is high in B vitamins, is a low GI sweetner & has a slightly malty taste. Now, how best to consume this ? Ultimately you need to try different combinations & see which ones gives you the biggest pleasure. According to That Protein, it is designed to be added to mylk, so I have tried it with organic diary milk, which I like, as well as Oat Milk (ok, but a bit too bland) and Rude Health’s Brown Rice drink with a hint of vanilla, which is my favourite option. 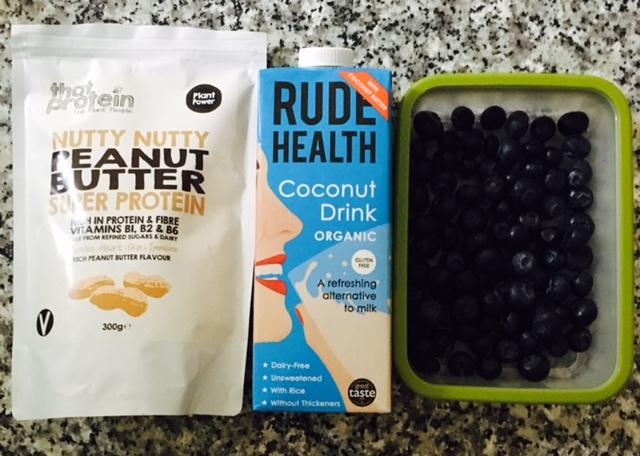 Darlene recommended using 300 ml of cashew milk, three heaped table spoons of the protein powder and a little of Pip & Nut butter of your choice – for my own decadent treat, particularly when I crave something sweet, I add a generous spoon of Pip & Nut Chocolate & Hazelnut Butter to my protein cocktails. I also tend to add a small banana or a handful of blueberries, as well as The Beauty Chef Cleanse Powder or some Maca for energy and some Baobab, if I feel like a need a bit more of Vitamin C. Darlene also gave me an option of adding this powder to yogurt (it works well with natural or vanilla Coyo) and I sometimes add it to my morning granola, where grated pear compliments the overall flavour. This protein powder also works well as one of the porridge ingredients, which you add to the porridge when it is ready. Or mix it into the buckwheat pancake batter, which adds a little bit of maltiness to the flavour. When I noticed that the Peanut Butter was partially defatted on the ingredient list, I asked Darlene about it and she replied saying that if a full-fat peanut butter was used, it would have been too ‘oily’ for the powder and also very high in fat. This process doesn’t affect nutrition & demonstrates that That Protein does look at the multiple angles when developing their protein powders, which is reassuring to me, as consumer. I also appreciate an open dialogue with the brand, allowing me to not only get answers to my questions, but actually expand my own knowledge going forward.